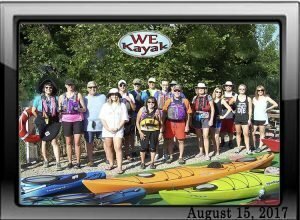 2019 is Water’s Edge (WE) Kayak Grosse Ile’s 7th season. This weekly paddle leaves from the soft kayak launch at Water’s Edge Marina on Grosse Ile. The route on the Detroit River and the canals of Grosse Ile will be dependent on the group and the conditions. Group Paddles are not a tour: we get together to improve our paddling skills, meet new paddling friends and enjoy the time on the water. Paddling Time: Average 1.5 -2 hours. Route Classification: Beginner/Intermediate Paddle – The soft launch, in the protected Bridge Cove, provides for a paddler friendly launch. Paddlers should be comfortable in active water due to the potential paddling conditions, caused by wind, waves, current and boat wake. Route: The route will vary depending on the group. Potential routes include (but are not limited to) paddling the Thorofare Canal, paddling downstream on the Detroit River to Swan Island, or paddling upstream along the west side of Grosse Ile. Requirements: All paddlers must have a life jacket on and zipped for the duration of the paddle. We do not allow alcoholic beverages and we will not allow anyone under the influence of drugs or alcohol to paddle. These requirements are for your safety and the safety of the group. Parking: Please park next to the roadside fence. As a courtesy to the boaters in the marina DO NOT park in front of a boat slip or the hoist well. Restrooms: We recommend stopping before you get to the Water’s Edge Kayak launch. Cost: $35 Per Person For Kayak Rental – All Riverside Kayak Connection kayaks for tours are single sit-inside kayaks. When registering please provide your height and weight so that we bring an appropriate kayak. Free With Your Own Kayak – We require personal kayaks to be at least 12′ long and have double bulk-heads or be a sit-on-top. Registration: All of our tours require pre-registration. Our tours frequently fill up so register early. Cancellation Policy: If for any reason you have to cancel your reservation or change the date of your booking, please call at least 48 hours prior to the tour for a full refund. Tuesdays, May 28 – September 3, 2019 / 6:00 p.m. – 8:00 p.m.